In a recent paper, which can be downloaded here, Carvalho, Masini and Medeiros show that estimating counterfactuals in a non-stationary framework (when I say non-stationary it means integrated) is a tricky task. 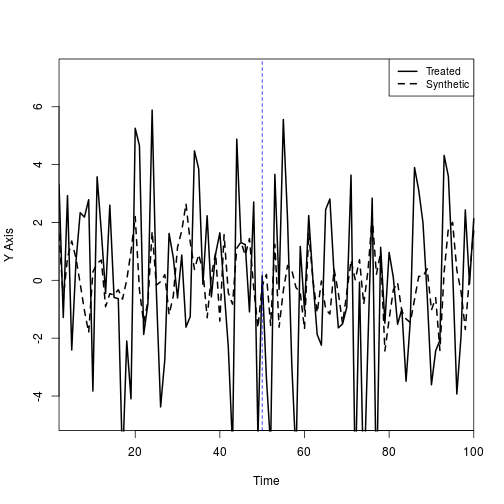 It is intuitive that the models will not work properly in the absence of cointegration (spurious case), but what the authors show is that even with cointegration, the average treatment effect (ATE) converges to a non-standard distribution. As a result, standard tests on the ATE will identify treatment effects in several cases when there is no effect at all. For those who are not familiar with counterfactual models: normally, these models have a treated unit (we want to know the effects of the treatment) and several untreated units that we call peers. These units may be cities, countries, companies, etc. Assuming that only one unit was treated and that there is no contamination, we can use information from the peers to project the behaviour of the treated unit as if it was not treated, which is the counterfactual. The models should also be able to identify if the treatment had no effects on the treated unit. Here I am going to generate some cointegrated data with no treatment to show the behaviour of the Synthetic Control and the ArCo (Other techniques will have the same features). The data is very simple and it is based on the mentioned article’s example. 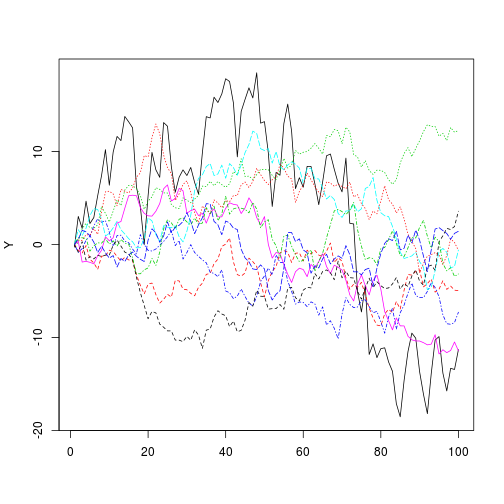 We are going to generate 100 observations of 10 time-series: 9 random walks and one that is the sum of these random walks plus an error. This last variable is the treated unit. However, I will not include any treatment in the data and I want the models capture this feature. The hypothesis to be tested is that at we had some treatment in the treated unit. First, I am going to estimate the ArCo. 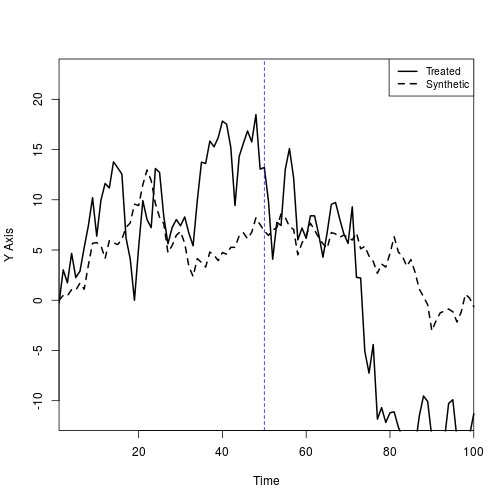 The $delta show the average treatment effect with 95% the confidence interval. As you can see, the test indicated that the treatment was statistically significant (the zero is very far from the confidence interval). 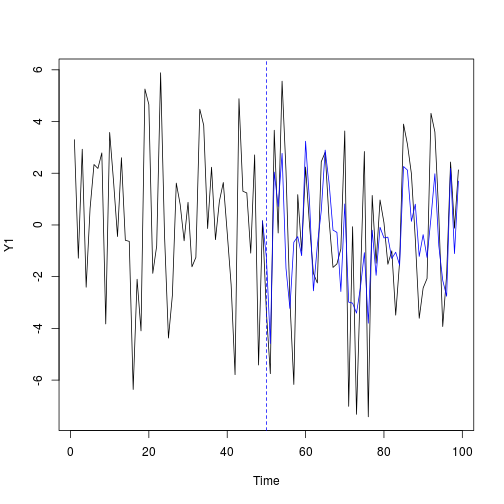 The plot also show a dislocated counterfactual (blue line). As you can see, the $delta in the ArCo showed that the treatment effect was statistically zero, which is true. 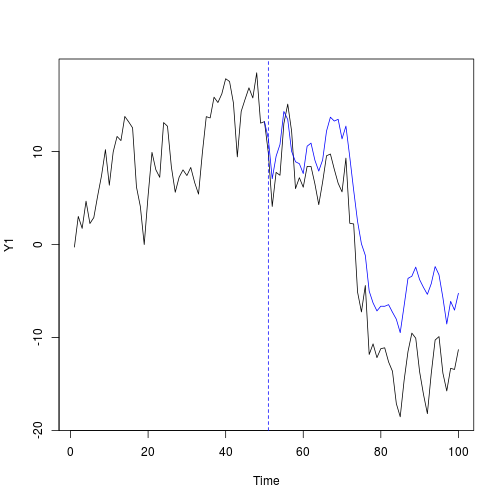 The Synthetic Control plot show similar results even though the model adjustment was not very good. Finally, note that we have two scenarios. If there is no intervention and we do not take the first difference we will probably wrongly reject the null hypothesis of no intervention. However, if we are in the “red line” case of the plot and we take the first difference, we will probably not reject the null when it may be false. This entry was posted in R and tagged ArCo, counterfactual, insightr, R, R blog, Synthetic Control. Bookmark the permalink. 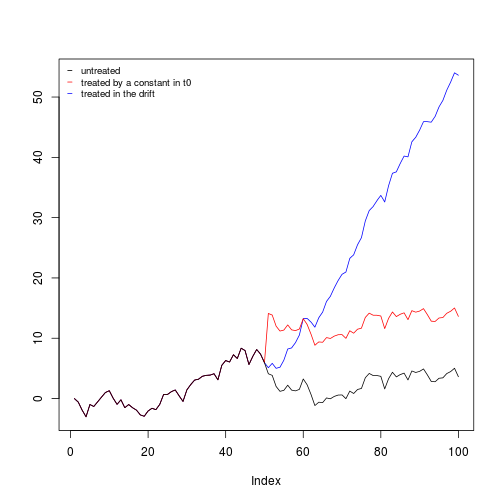 3 Responses to Counterfactual estimation on nonstationary data, be careful!! !